Taylor Swift's new album Reputation finally arrives today (November 10), and while it hasn't hit streaming services just yet, the singer has shared another track from it to tide over the casual fans who didn't pre-order the record with a magazine from Target. "New Year's Day" serves as the closing track on the new record, and it hears Swift stripping down the bombastic pop production featured on the rest of the album for a simpler, sweeter piano ballad. 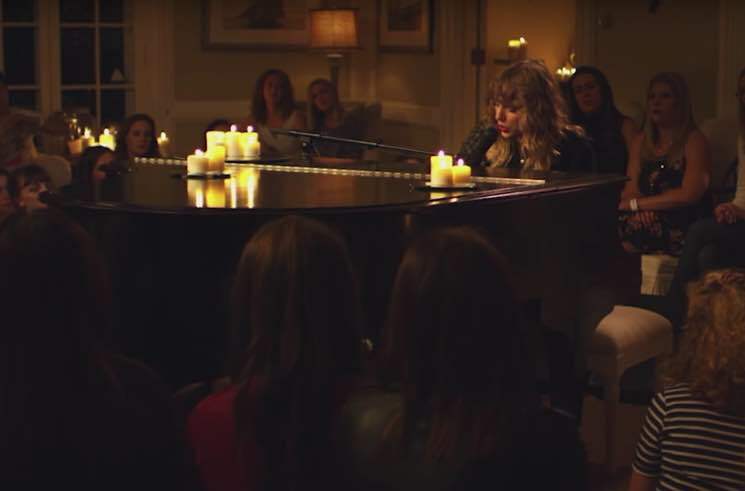 Adding an additional layer of earnestness to the tune, Swift has unveiled it with a video that captures her performing it for a 100 hand-picked fans at her Rhode Island home — a far cry from previously released singles "Look What You Made Me Do," "…Ready for It?," "Gorgeous" and "Call It What You Want." Watch the intimate performance video below, and order the new album on CD and double picture disc vinyl via Umusic.